JUNE 2015 | The Ruderman Family Foundation, in partnership with The Jewish Week Media Group, is proud to announce [words] Bookstore as one of ten recipients of the inaugural Best in Business Award. This national competition highlights North American businesses that have shown exemplary practices in hiring, training and supporting people with disabilities. 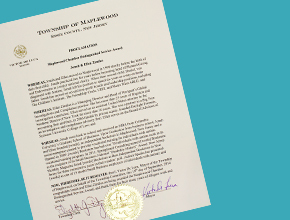 This September 2014, Jonah and Ellen Zimiles, [words] owners, were honored with the 2014 Distinguished Service Award by Maplewood Chamber of Commerce for their years of diligent service and excellence as citizens of Maplewood, New Jersey. In 2015, the family will celebrate their 25th anniversary living in town. The Village Green just covered our Small Business Saturday (Nov. 29, 2014) window display, featuring shopping bags hand-painted by artist Meghan Keane. Earl “The Pearl” Monroe spoke at [words] recently, talking about his experience as an NBA All Star and Hall of Famer, along with his just published memoir. Check out the great photos posted for this event in West Orange Patch: Words Bookstore Hosts ‘Earl the Pearl’. 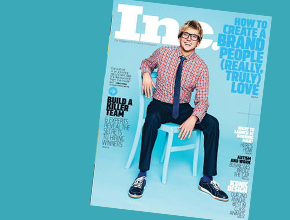 [words] Bookstore has been featured in Entrepreneur Magazine twice since opening. Our first article was recently re-released for reading and download. Check out the great article in PDF format here! 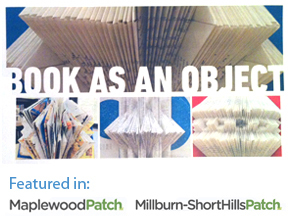 This March, [words] Bookstore exhibited books transformed into works for art, created by Millburn Middle School student artists. 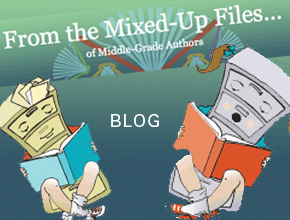 From the Mixed-Up Files is the group blog of middle-grade authors celebrating books for middle-grade readers. They feature updated booklists organized by unique categories, author interviews, market news, and a behind-the-scenes look at the making of children’s books from writing to publishing to promoting.